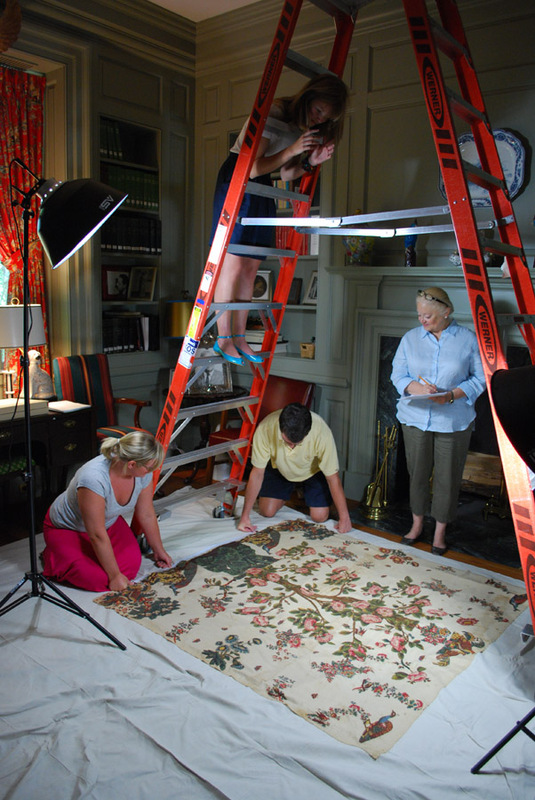 Under the supervision of Collections Manager Joyce Keegan (far right), Courtney helps to spread out a quilt in Drayton Hall's collection for photographing. I have been interning with the Preservation Department at Drayton Hall for the past month. Each day I get to work on a variety of projects, which is something I was hoping to experience during my internship. I like the fact that from hour to hour I am assigned different tasks which means that I am always learning something new. I started out by helping Trish Smith, the 2010 Drayton Hall Wood Family Fellow with PastPerfect museum management software, and quickly learned how an archival system works. It is interesting to see what types of documents and stories have been saved throughout the years relating to the preservation projects around the property. The next project I worked on was photographing all of the museum collection objects. This took a lot of time, coordination, and patience, but the experience was worth it. It was not just a great feeling to handle such valuable objects, but also to be able to capture the significance of each individual object. The next task in this project is to sort through all of the photographs and begin the editing process in order to get them ready for a collections catalog. Just this past week I was able to again experience something new. I learned how to wash and categorize recently excavated artifacts. This was interesting to me because I have never been exposed to archaeology and it is something that I have been itching to get my hands on. Looks like tomorrow I will be learning how the “RP” (Revolutionary Preservation) System works. This is a relatively new system that helps control corrosion on the iron artifacts that were excavated in the 1970s and 80s. I have already had many different experiences in just a few weeks and look forward to what unfolds for me in the month to come.